Dicker & Deal Inc.’s 5th expansion Dicker & Deal Cash Center opened its doors for business in September of 2004. Expanding our business into downtown Jackson enabled us to bring the same quality of service and products you would expect from Dicker & Deal without the drive! Dicker and Deal’s goal is to provide our customers with quality pre-owned merchandise at prices far below retail, and to create an atmosphere that invites all people to shop here, even those who would not ordinarily consider buying second hand. We pride ourselves on building trusting, long lasting relationships with our customers. We recognize the importance of your time, money and we make every effort to give our customers the best merchandise loans, the best service, and the best value in a quick, easy hassle freeway. Dicker and Deal Cash Center also provides the general public with Temporary Cash Services. If you live in the Greater Jackson area and need cash fast, we are your best choice for merchandise loans. We offer our customers a quick, convenient and confidential way to borrow money when you need it most. Getting a loan at Dicker & Deal is easy – we loan money based on your valuables, NOT on your credit. And, we’ll match or beat any deal. Extraordinary Jewelry at Wholesale Prices! At Dicker & Deal Cash Center, you will always find an amazing selection of over 2000 pieces on any given day. The varieties are endless, so your sure to find something to fit your style. For an anniversary or just because, you can be assured of quality and service from Dicker & Deal Cash Center. LOANS ON JEWELRY ~ BORROW $5 TO $50,000 IN JUST A FEW MINUTES. Dicker & Deal Cash Center is Buying 6 Days A Week! Obtaining a Merchandise Loan is quick, easy, and completely confidential. Simply bring in your merchandise for an appraisal, and walk out with cash in your hand! All merchandise is securely packaged, labeled and stored, so you can be assured you will get back exactly what you gave us. It’s that easy. Why Pay Retail Ever Again? Dicker and Deal Cash Center can fill all your home entertainment needs. If your looking for a great “Deal” you’ve come to the right place! We stand behind the products we sell 100% and even offer free warranties on all of our electronic equipment! LOANS ON ELECTRONICS ~ BORROW $5 TO $50,000 IN JUST A FEW MINUTES. Dicker and Deal Cash Center can fill all your Electronic needs. If your looking for a “Deal” you’ve come to the right place! We stand behind the products we sell 100% and even offer free warranties on all of our electronic equipment! Dicker and Deal Cash Center has a huge selection of Home and Car Audio systems. Whether you are an Audiophile or just like your music loud, we have what you need. With names like Bose, Klipsch, Polk Audio, Sony, Kicker, Kenwood, Rockford Fosgate, just to name a few, Why go anywhere else? Dicker and Deal Cash Center can fill all your Audio needs. If your looking for a “Deal” you’ve come to the right place! We stand behind the products we sell 100% and even offer free warranties on most of our audio equipment. LOANS ON HOME & CAR AUDIO ~ BORROW $5 TO $50,000 IN JUST A FEW MINUTES. Forget paying full big box store prices for that drill or wrench! We have an ever-changing selection of a number of popular power tools. 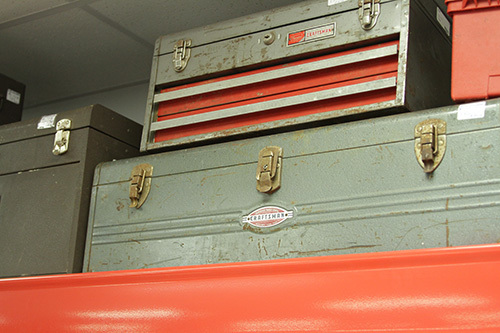 All of our tools are gently used, inspected and in great repair. And with names like Snap On, Mac, Matco, Dewalt, Porter Cable, Craftsman and Hitachi, you’ll be sure to find exactly what you need for that next big home improvement project. We have Wheels! Stop in and check out our selection of rims. 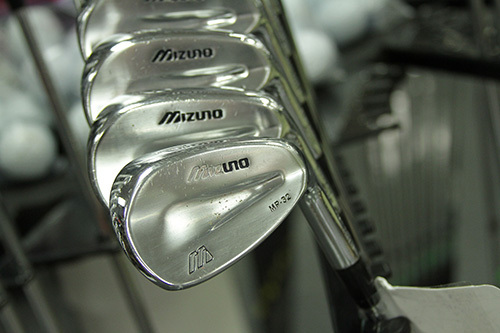 We have chrome, black, polished, come see for yourself! LOANS ON TOOLS, TIRES & LAWN EQUIPMENT ~ BORROW $5 TO $50,000 IN JUST A FEW MINUTES. Hey all you Outdoor Enthusiasts & Athletes! Get down to Dicker and Deal Cash Center to check out our Sporting Goods Department! We have equipment for all the sports you play, and outdoor equipment, at those famous D&D low prices. Don’t miss out on all of those fun and exciting activities and stop in today! We have bikes, golf, tennis, football, basketball, weight sets, canoe, saddles,paintball gun, and more. Stop in to Dicker and Deal and see for yourself. LOANS ON SPORTING GOODS ~ BORROW $5 TO $50,000 IN JUST A FEW MINUTES. HEY ALL YOU HUNTERS! WE HAVE SOMETHING FOR EVERY ENTHUSIASTIC SHOOTER! Whether you’re a first timer, experienced hunter, or collector, we have a great selection of shotguns, rifles and bows. With our constantly revolving inventory of guns, with names like Remington, Winchester, Mossberg, and Browning, just to name a few, you can’t go wrong with Dicker & Deal Cash Center! Dicker & Deal Cash Center is a Federal Firearm Licensed Dealer. LONG GUN LOANS ~ BORROW $5 TO $50,000 IN JUST A FEW MINUTES. Dicker & Deal Cash Center is Buying 6 Days A Week! Obtaining a Merchandise Loan is quick, easy, and completely confidential. Simply bring in your merchandise for an appraisal, and walk out with cash in your hand! All merchandise is securely packaged, labeled and stored, so you can be assured you will get back exactly what you gave us. It’s that easy. MUSICAL INSTRUMENT LOANS ~ BORROW $5 TO $50,000 IN JUST A FEW MINUTES. For centuries, buying gold has been recognized as one of the best ways to preserve one’s wealth and purchasing power. Gold is a unique investment, one that has served mankind well for thousands of years. From the times of ancient Egyptians, Greeks and Romans to more modern times, man has been fascinated with the beauty and magic of gold, and with its power to change men’s lives. Dicker & Deal would like to help change your life. We are paying top dollar for all of your unwanted jewelry, even if its broken! It’s time to get the cash you deserve for your gold in an easy and confidential process. Be part of what many have already experienced! Don’t want to part with your jewelry but need some cash? You don’t have to with Dicker & Deal! BORROW $5 TO $50,000 IN JUST A FEW MINUTES. Dicker and Deal will loan money on most anything you have that is valuable: jewelry, tools, electronics, and much, much more. We offer 15 and 30 day instant cash loans on your valuables, not your credit. No credit checks! Other lending institutions check your credit history – we do not. We lend cash instantly on your items. No impact to your credit report! Obtaining a Merchandise Loan is quick, easy, and completely confidential. Simply bring in your merchandise for an appraisal, and walk out with cash in your hand! All merchandise is securely packaged, labeled and stored, so you can be assured you will get back exactly what you gave us. It’s that easy. We value your property and take good care of it. Licensed by the state of Michigan and fully insured, we give you peace of mind. Family owned and operated, Dicker & Deal has been serving the Greater Lansing area since 1973. We pride ourselves on building trusting, long-term relationships with our customers. We appreciate your business. Dicker and Deal Cash Center will loan money on most anything you have that is valuable: jewelry, tools, electronics, and much, much more. We offer 15 and 30 day instant cash loans on your valuables, not your credit. No credit checks! Other lending institutions check your credit history – we do not. We lend cash instantly on your items. No impact to your credit report! Have you upgraded, or simply have items taking up room that you just don’t want any more? DICKER & DEAL IS BUYING 6 DAYS A WEEK! We value your property and take good care of it. Licensed by the state of Michigan and fully insured, we give you peace of mind. Family owned and operated, Dicker & Deal has been serving the Greater Lansing area since 1973. We pride ourselves on building trusting, long-term relationships with our customers. We appreciate your business. We offer 15 and 30 day instant cash loans on your valuables, not your credit. Other lending institutions check your credit history – we do not. We lend cash instantly on your items. No impact to your credit report! We value your property and take good care of it. Licensed by the City of Lansing and fully insured, we give you peace of mind. Loans are a quick and easy way to borrow money without a credit check or hassle. Loans are based on the value of your collateral, not your credit rating or pay schedule. A typical loan has a term length of 15 or 30 days. If you cannot pay your loan back in full, we offer extensions to give you extra time. You may also choose to surrender your collateral as payment in full. What is an extension / renewal? If you are unable to pay back your loan in full on its due date, you may get a renewal/ extension. That means that you pay the re-purchase option fee on your loan in full and the new due date is set. The principal loan amount remains the same, as does the re-purchase option fee. You may extend the length of your loan as many times as you wish. Loan amount is based on the current value of your item. Item’s condition, market value and our ability to resell the item all play a role in determining the price. Our highly trained associates will use all research tools at hand to evaluate item’s value and get you the cash you need or the most they can. We test all items for their performance. General merchandise is visually inspected and then tested by plugging it in and turning it on. Accessories such as remote controls and original cables all add to the value of an item. Gold & Diamonds are tested using jewelry loupe and electronic testers noting the cut/color/clarity/carat (the 4 C’s). Items in good condition usually get appraised at higher value. We will also buy any broken gold jewelry. How do you determine the price of gold, silver or platinum? The price of commodity is based on current market values. Prices can fluctuate greatly due to unstable economy and market conditions. Yes. You can have unlimited number of loans with Dicker & Deal at the same time. Can you give me a quote on my item over the telephone? Unfortunately we cannot provide accurate quotes over the telephone. Loans are greatly based on the condition of an item which is not possible to establish over the phone. The item has to be inspected by one of our associates. Is the information about my loan secure and confidential? Yes. All aspects about any transaction are confidential and secure. Dicker & Deal does not share any collected information with any private parties. Why does the loan amount differ from the retail price? Loan standards are based on current market value for pre-owned merchandise. The loan amount we are able to give you is based on our ability to resell the item in the future if it is forfeited. Pre-owned items sell for much less than new items therefore they are worth less as collateral. At the same time they are priced accordingly if become available for sale in our store. Our customers enjoy the convenience of being able to trade unwanted items for something else they need. Is my collateral safe while in loan? It is our duty to keep all items safe and in a secure area while in loan. It is also our responsibility to keep them in good condition. All accessories brought with the item are kept together in secure area, and will be returned when the loan is paid in full. Our loan inventory is linked with the state of the art computer system that allows us to track all items at any given time. Can someone else pick up my loan? Yes, but you must give the name of that person to one of our associates in person rather than over the phone. Anyone however may pay on your loan on your behalf as many times as needed. Are second hand stores regulated? Yes. We are subject to many State, Federal and local laws. State and local authorities strictly regulate all aspects associated with loan transactions. Are second hand stores stocked with stolen merchandise? Regardless of what you see on TV and in the movies, second hand stores & pawnshops are the worst place to get rid of stolen merchandise, and criminals know about that. All items obtained by Dicker & Deal are processed through an Internet-based crime-fighting tool called Business Watch International, where information on all loans and sold items is shared with police departments nationwide. All items are held for 14 days before cleared by local authorities and only then are available for sale. Each customer is required to present a valid government issued I.D. and be fingerprinted at the time of business. Pawn broking is the oldest method of lending money; it dates back to early China 3,000 years ago. Pawnshops served as primary lenders to their communities and provided financial bases for some of the more important historical events of their times. According to the National Pawnbrokers Association, even Queen Isabella of Spain pawned her royal jewels to finance Christopher Columbus’ expedition to the New World. The pawn industry came to America with the first settlers in the early parts of the 18th century. Pawn broking was regarded as the main source of consumer credit. With the rise of large consumer credit institutions, such as finance corporations, savings and loan associations, and credit unions, the pawn shop is no longer the main source of consumer credit but it plays a vital role in it. Pawnbrokers loan money to people based on the value of the items they pledge as collateral. In recent years many pawnshops became an easy way to get rid of unwanted goods. 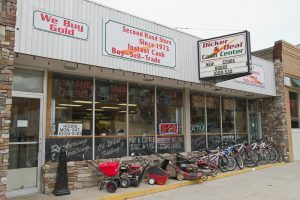 Dicker & Deal is not a pawn store but is a second hand store that offers “pawn-like” services, and offers many services previously not offered by the industry. Merchandise loans, check cashing, bill pay, purchases of unneeded items, and ability to exchange items through the recycling program are some of the services offered. The general public needs to borrow small sums of money that other financial sources are not willing to provide. What chance do you think you would have in securing a $300.00 or smaller loan from a financial institution for any period? The cost of the paper work alone prohibits them from making such loans on a regular basis. Dicker & Deal offers short term collateral loans ranging from five to fifty thousand dollars. All items obtained by Dicker & Deal are processed through an Internet-based crime-fighting tool called Business Watch International, where information on all loaned or sold items is shared with police departments nationwide. All items are held for 14 days before cleared by local authorities, and then put for sale. Each customer is required to present a valid government issued I.D. and be fingerprinted at the time of business. Regardless of what you see on TV or in the movies second hand stores and pawnshops are the worst place to get rid of stolen merchandise. We train our associates to be on the lookout for any stolen items. Click the ‘CHOOSE FILE’ button to the right to browse your files for the item you would like to sell. Once you have selected your image file, please click the ‘OPEN’ button to complete the process. Please fill out the form to the right and click ‘SUBMIT’. Once we receive your submission, someone will contact you as soon as possible. Many previously enjoyed items may be cluttering your living and storage space. Dicker & Deal offers convenient and valuable service that allows one to sell unneeded items for cash or exchange them for other items. This program was initiated to provide families with instant spare capital and it’s an easy way to update your lifestyle. You can bring goods, such as jewelry, gold, platinum, diamonds, broken gold, tools, electronics, musical instruments, car stereos, motorcycles, ATV’s and many other valuables into Dicker & Deal and we will evaluate each item and provide you with cash in minutes. You end up with extra spending money, organized living space, and a good deed by helping other families with getting items they need. Many of our customers save thousands of dollars throughout the year. You get a great shopping experience with discount prices at Dicker & Deal. All items are tested and certified to fully-function. Since most of our merchandise is pre-owned, there is no surplus inventory, so when you find something you like, buy it when you see it as it might not be there tomorrow. Dicker & Deal offers an easy lay-away plan. Just put 20% down to secure the item and 30 days to pay for it.